Leading broadcasters such as Viacom18, Star India, Zee Entertainment Enterprises, Sony Pictures Networks India and Times Network are leaving no stone unturned in order to win every single consumer under the new tariff regime. The broadcasters rolled out 360-degree campaign to reach out to the hinterland, with special focus on television, radio and print. Industry experts said the broadcasters played on their strength and succeeded in attracting the interest of consumers. “Individual channels such as Zee, Star Group have created specific advertisements to educate consumers about the change. These ads are aired during primetime for maximum reach. This helped inform consumers about the regime and new pricing system,” the expert said. Each broadcaster tried to touch upon the consumers’ interest to inform them about their packs. Star India was the first broadcaster to launch an awareness campaign, ‘Sach Mein’, across its networks, with special preference to digital. The campaign is shown in seven languages — Hindi, Bengali, Marathi, Tamil, Telugu, Kannada and Malayalam. Created by Star India’s in-house team, the campaign features stars such as Aamir Khan, Mohanlal, Kamal Hassan, Nagarjuna, Bengali movie star Dev, Kannada film star Darshan Thoogudeep and Swapnil Joshi. Sach Mein highlights a reverse talk wherein the stars bargain with the shopkeeper to increase the package charges while the shopkeeper keeps refusing and sticks to the set rate. Sanjay Gupta, Managing Director, Star India, said, “I think communication is a big draw for everyone, the distribution as well as the content industries. We have launched a campaign across seven languages. We are also giving a huge digital push through website, Hotstar and other digital assets. We are also ensuring more ways to communicate with the consumers and we are trying to have a very simple communication through IBF and Star by simply explaining to the consumers about the change." Zee Entertainment Enterprises Limited was the second broadcaster to launch an informative campaign, educating not only the consumer but also the trade-ecosystem about the tariff policy. As the TRAI has given consumers rights to choose their preferred channels, Zee initiated a multimedia campaign ‘Channels Ka Chunaav 2019’, keeping in mind the topicality of elections and the power of choice that has the ability to change status quo. With the tag line ‘Family Ki Suno, Zee Ko Chuno!’, the broadcaster urged viewers to fulfil the demands of all family members by choosing the Zee pack. Zee got on board a few popular faces from their shows. Zee has also launched initiatives such as WhatsApp outreach, Zee infographic, digital push and posters to educate the consumers. Viacom18 and TV18 have tapped into consumers psyche by focusing on the value proposition through its multi-media marketing campaign, ‘Ek Mein Hai More Yahaan’. 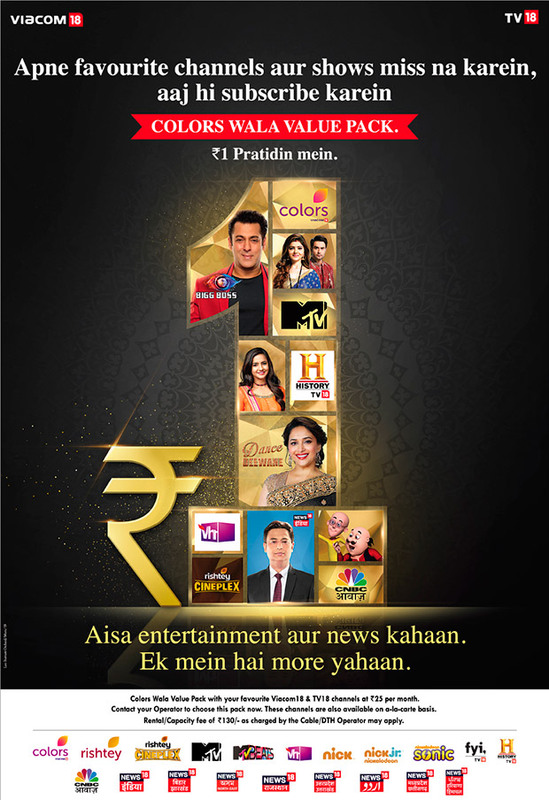 The campaign advocates the comprehensive value for money that the ‘Colors wala Pack’ provides to the Indian viewers. The campaign highlights the strategy of the network, which has packaged its bouquets to help the viewers keep their monthly budgets at a minimum. The campaign educates the audience about the entertainment and news they can avail of at Re 1 per day. ‘Ek Mein Hai More Yahaan’ campaign is driven by prominent faces such as Rohit Shetty, Neha Dhupia, Malaika Arora, Mahesh Manjrekar, Arya, and other celebrities from Viacom18’s stable. Similarly, Sony Pictures Network has banked on Amitabh Bachchan to reach out its viewers. The #RishtaPakkaSamjho campaign with Amitabh Bachchan was rolled out to educate the consumer about the various pricing options so that they can make an informed choice. Instead of focusing on the consumer in general, Times Network narrowed its focus on the channel’s target audience, mainly men. The broadcaster came out with an advertorial ‘Times M.A.N (Movies and News) Pack’ with a tag line ‘Gift Yourself A Better Man’. 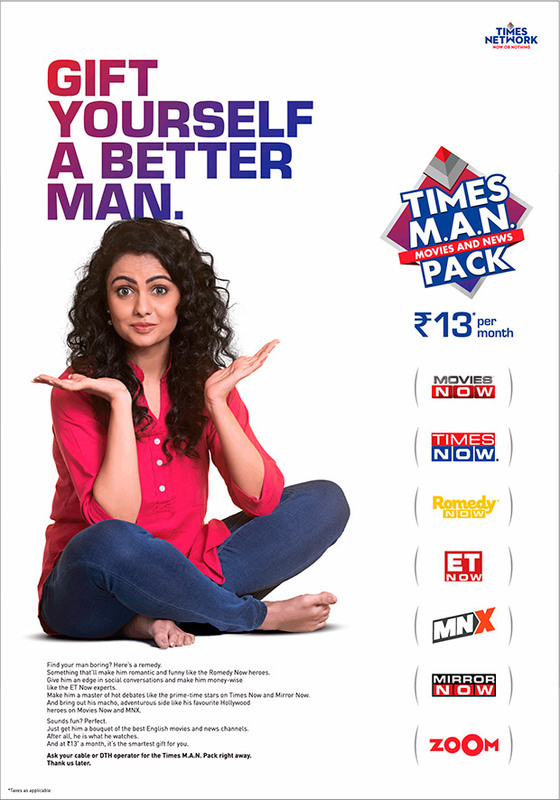 In the campaign, the broadcaster highlighted how the male audience within the family can be entertained through the Times pack as it not only offers general and business news through Mirror Now and ET Now but also has action, romance, lifestyle and comedy in the form of Romedy Now, Movies Now, MNX and Zoom.